The U.S. pharmaceutical plastic bottles market is considered as high fragmented in nature, owing to the existence of a large number of players operating in it, states a research report by Transparency Market Research. With an expected rise in the participation of new players, the competition landscape of the market is predicted to get intense in the coming years. The prominent players, namely Gerresheimer AG., Berry Plastics groups Inc., Amcor Ltd., and AptarGroup Inc. are expected to collectively account for a key share of the overall market throughout the forecast period. These players are estimated to focus on the development and launch of new products in order to gain a competitive edge over the other players and sustain in the market in the near future. Furthermore, innovations and technological advancements are projected to accelerate the growth of the market. 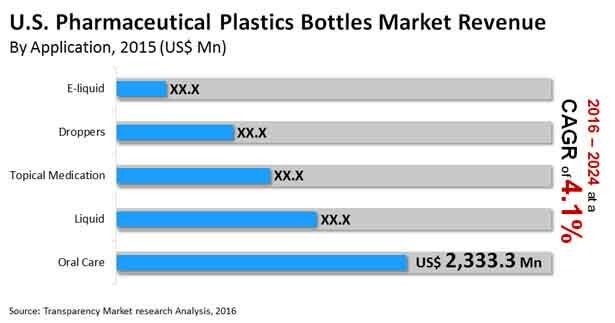 According to the research study by Transparency Market Research, in 2016, the U.S. market for pharmaceutical plastic bottles was worth US$6.7 bn and is estimated to reach a value of US$9.2 bn by the end of 2024. The market is projected to register a healthy 4.10% CAGR between 2016 and 2024. On the basis of bottle type, the U.S. market for pharmaceutical plastic bottles has been divided into dropper, packer, liquid, and other bottles. Among these segments, the packer bottles segment is predicted to lead the U.S. pharmaceutical plastic bottles market and is anticipated to account for more than half of the overall market throughout the forecast period. The high growth of this region can be attributed to the tremendously growing preference for customized pharmaceutical plastic packer bottles. On the other hand, the segment for liquid bottles is predicted to witness a remarkable growth in the next few years, owing to the retention of drug content. Furthermore, in terms of end use, the pharmaceutical plastic bottles market in the U.S. has been divided into compounding pharmacies, pharmaceutical companies, chemical companies, pharmaceutical packaging companies, and healthcare centers. The segment for pharmaceutical companies is predicted to lead the U.S. pharmaceutical plastic bottles market, owing to the rising demand for diverse bottles. In addition, the increasing uptake of plastic material for packaging and the expansion of the healthcare sector are some of the important factors that are anticipated to fuel the growth of this segment in the coming few years. The healthcare centers segment, on the other hand, is projected to witness a healthy growth throughout the forecast period. The U.S. market for pharmaceutical plastic bottles is anticipated to grow significantly throughout the forecast period. The increasing concerns related to the sustainability of medicines is one of the key factors estimated to encourage the growth of the overall market in the coming years. In addition, the rising number of steps taken by government bodies and key players to reduce the environmental impact of the boost the rate of plastic recycling are projected to accelerate the growth of the overall market in the next few years. Furthermore, the risk of chemical reactions of medicines in bottles has reduced tremendously owing to the use of plastic bottles, which is further anticipated to supplement the growth of the market in the near future. On the flip side, the easy availability of several eco-friendly alternatives for plastic bottles such as metal and glass is one of the major factors anticipated to restrict the growth of the U.S. pharmaceutical plastic bottled market throughout the forecast period. Nevertheless, the tremendously rising popularity for plastic bottles for storage of medicines and drugs, owing to its convenience, safety, and security is likely to encourage the growth of the market in the next few years.